“On a hot summer afternoon, I decide to go for a walk along the sea. I follow the coast path, lulled by the cicadas, the wind in the pine trees and the sound of the sea. I sit down on the large limestones sprinkled with bright green samphires ; I rub the tiny samphire flowers against my fingers : the green note of galbanum, the bitter note of the coarse of a lemon, its sparkling freshness blend with the mineral and salty notes of the limestones, deeply anchored in the sea. I start walking again and I enter the maquis : the leaves of rosemary, thym, myrtle, cistus linger on my fingers and perfume my hands with their dry warmth and their camphoric notes. The faience lid was created with artist Pascal Mestre who is a specialist in the mixed-clays technique, a technique invited in Provence three centuries ago. 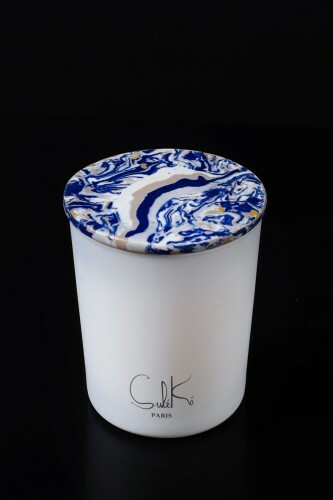 The lid narrates the facets of the perfume with specific shapes and carefully selected colors : there is the blinding sun of a summer day, the white limestones, the deep blue of the mediterranean sea, the pine niddles and pine cones which cover the paths with their brown hues…a clay which reflects the South of France, the Midi ! Each lid is unique, numbered and signed by the artist.